Just had to do some letsencrypt setup in some servers so I figured I should write down what I did so I can just check this page again instead of digging how I did it previously. This assumes the server only serves https and redirects all http traffic. Adjust as needed otherwise. Full nginx SSL/TLS config not included. At this step, the certificate and all should have been properly generated. If the full path seems too long, symlink it to nginx config base directory or something. Don’t forget to update nginx configuration as before. Make executable, etc. Try it to make sure it runs properly. Then add it crontab. I usually do it weekly. There might be smarter way using certbot’s nginx plugin or something but I haven’t bothered reading its documentation and initially this was just a stopgap switching from acme-client which is way simpler but stopped working for me few months ago. This hit me when I was rewriting front-end part of Zeropaste. Of course later I found out that there’s gem for it. But anyway, if you don’t want to add another gem and feel like writing crapload of divs, it’s not that difficult. It breaks Rails standard form error handling though. Took me good few hours to find out why specific combination of task performs incredibly slowly on my server. For reference, in my case it’s port-forwarded ssh/https connection over openvpn. Doing anything which takes up bandwidth (displaying log files, etc) will shoot the cpu load (at interrupt) up by a lot. By a lot I mean over 50% of one core. This guy have the reasoning why it’s happening but I don’t know how much of it is correct. VMware support page also suggesting disabling it if network performance is slow. It seems to involve a shell script in Linux so I won’t bother writing it off here since it differs by system. A few years ago I wrote a php script to provide better autoindex within nginx. I used it for quite a long period until I rewrote it in Ruby/Sinatra. But then I figured the setup for it is overly complicated just for simple task. And takes additional memory. I always have php-fpm running anyway so it’s free. And so I decided to take up the old php script and fix it up. Unfortunately there isn’t other language as easy to setup for web as php which is why I fixed it instead of rewriting in some other languages (or keeping it ruby). The “fixed” version is still pretty much imperative-style but hey, it works. I’ve been wasting time on this thing called 2048 lately. 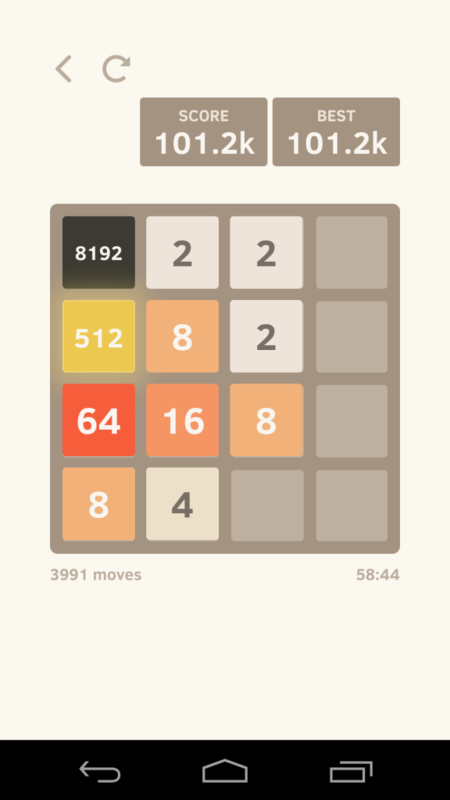 And finally obtained my then-current goal of 8192. And then ended at 112k score since I wasn’t careful enough. For god knows how long, proxy_set_header X-Forwarded-For $proxy_add_x_forwarded_for; is one of the line usually included in nginx config snippet for proxying to a unicorn (Rails) backend. …which is something you should never do unless you have another load balancer in front of the nginx being configured. That line basically tells nginx to append $remote_addr to whatever X-Forwarded-For value currently set. It is only useful when your nginx is behind other load balancer which set up its own (hopefully correctly) X-Forwarded-For. It should be set explicitly to $remote_addr for any external-facing proxy. Otherwise fun things will happen. pkg version -ovL => -O "$pkgorig"
pkg-lock-outdated | cut -f 1 -d '<' > "$listfile"
There’s another alternative of unlocking all packages at once, run batched portmaster, and lock them all again.